The “best case” (shortest) amount of time it will take to complete the task. The most likely amount of time it will take to complete the task. The “worst case” (longest) amount of time it will take to complete the task. There is a less than 1% chance that this task will take less than 2 hours. There is a 50% chance that this task will take less than 4 hours. There is a greater than 99% chance that this task will take less than 6 hours. This explicit statement of probabilities represents a distribution of likely outcomes. Statisticians would phrase it in a confusing (but mathematically important) way. They would say “if we sampled a large population of people (like you) doing this task, no more than 1% of them would complete the task in under 2 hours, no more than 1% of them would spend more than 6 hours on this task, and half of the people would complete the task in under 4 hours.” For the purpose of estimation, you can ignore the statistic-speak and just look at the “odds” of how long it will take you to complete the task once. Although bias stemming from misspecified activity time probability models is rarely mentioned in introductory discussions, we have seen several instances of this bias in simple examples. First, and perhaps most important is the uncertainty as regards the underlying activity time probability models. The literature offers no less than five procedures for translating the subjective estimates (a,m,b) into specific β-distributions. As shown, the methods lead to distinct β-distributions, and the PERT approximation need not satisfactorily estimate any of them. 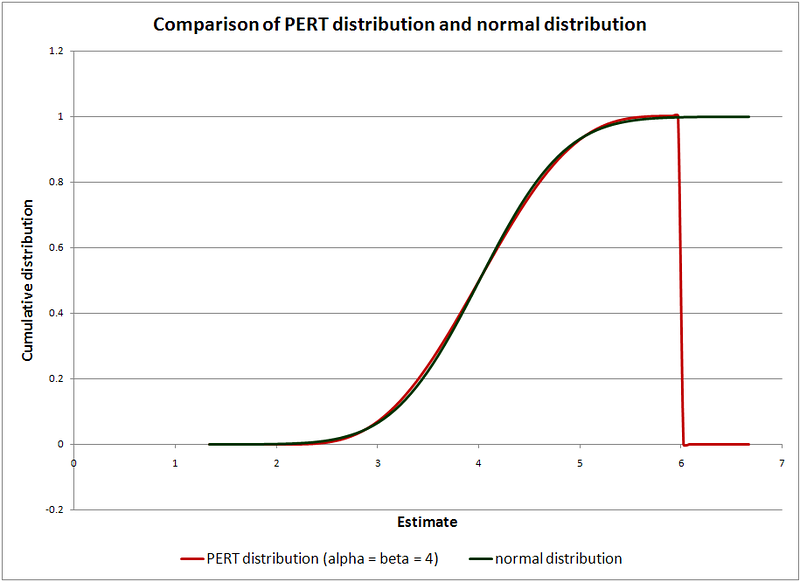 The beta distribution for a symmetrical PERT estimate looks very much like a normal distribution. 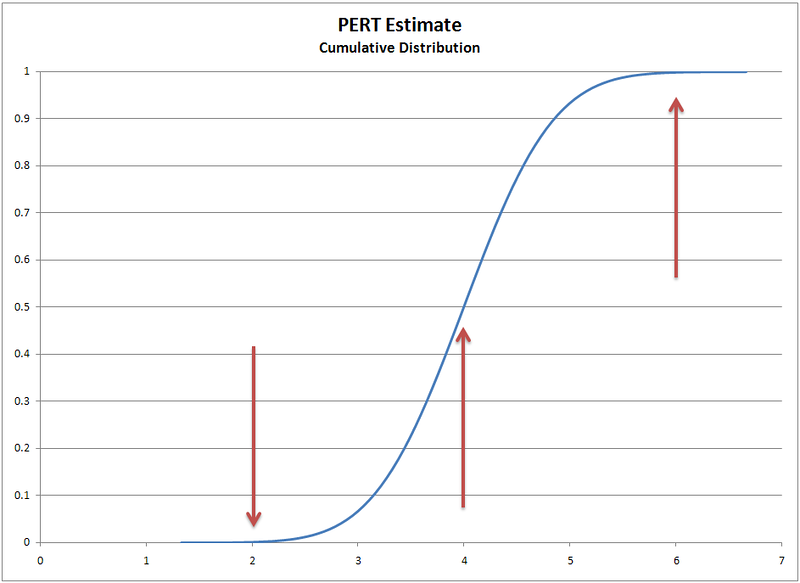 You can see this by comparing the cumulative distribution function of the PERT and normal models for this 2/4/6 example. Based on this similarity in distribution, and the inherent uncertainty in what the shape of the distribution really looks like, there are some benefits to treating the PERT estimate (2/4/6) as a normal distribution where the high and low values represent +/- 3 sigma bounding. This approximation provides us some benefits when aggregating individual task estimates into combined project estimates. If you’re doing iterative development you might find interesting the calculators (“Release Calculator” and “Wiggle Room Calculator”) that you can find in the sidebar of my website positiveincline.com. Tweet me (@asplake) if you find them interesting/useful or have suggestions for others. Hey, thanks Mike. Pretty neat calculators. Somewhere (or some-when) I wrote up an analysis of agile estimation, based on Mike Cohn’s work. Maybe an old blog article that I can’t find, but I think it was something for a client. The key element was that using velocity to manage / predict “rough estimates” based deliverability distinctly from detailed (PERT) estimates for tasks made sense, because you still get the feedback loop that removes uncertainty from the estimation process. Can’t find the write-up. Long story short, I think the calculator can come in handy for that ‘planning estimation’ phase. Your articles about PERT are the best ones I have ever read! Very well explained. 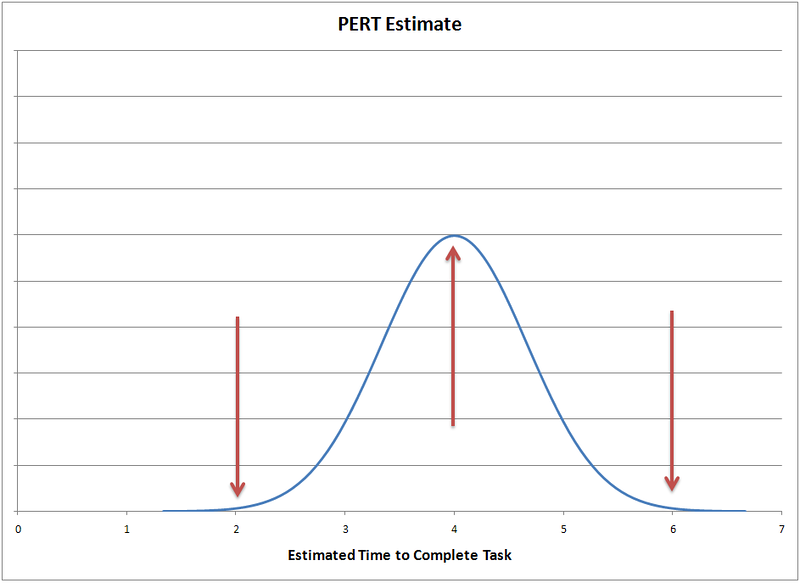 Your advanced article is great explaining why PERT estimates cannot be added. No other article I have read has mentioned this. I have looked all over internet to find a spreadsheet that calculates PERT correctly and doesn’t just add the estimates. Despite my efforts I have not been able to find a good one. Do you have a good spreadsheet or can recommend a good PM tool for this? I don’t have a template-spreadsheet for doing this, I’ve just built them on the fly as projects required them. I’ll put one together for a future article. It will be tricky to come up with a general way to identify related tasks (versus unrelated tasks) – but I have an idea about how to do it. If you subscribe to the blog, you’ll get an email when it shows up. I hope you find it useful. I added some comments, it should be easy to steal from for your own projects. Everyone else – enjoy :). Math is free. How do I combine 3 or more correlated PERT estimates, e.g. 2/4/6 and 3/5/10 and 4/6/12 with rho=0.75? Thanks for the question. What I’ve learned about correlation between distributions (e.g. the amount of shared-variation) has always been in terms of looking at two distributions, never three. So, you raised an interesting question. I sort of alluded to the answer (when I talked about repeatedly combining pairs of estimates), but definitely didn’t explain it. I’m assuming that your rho=0.75 is the same between A (2/4/6) and B (3/5/10), as it is between A and C (4/6/12), as it is between B and C.
I couldn’t find any “real math” (e.g. from other people, or otherwise formally proven) to back me up on it, but my suspicion is that you just combine any pair (AB, BC, or AC) to create a new distribution, then combine that resultant distribution with the remaining initial set (C, A, or B, respectively). The combinations of distributions are combinations that input normal distribution approximations of the beta distributions (represented by the individual PERT estimates) and output normal distributions. So, the math should work for repeated combinations. I did a quick test, trying the above approach with all three sequences, and got the same result, regardless of the order in which I combined distributions. My resultant estimate for your example is 7.6/16.2/24.8 (std of 2.9). My approach was to determine the combined distribution for A+B -> AB (4.3/9.5/14.7) and for B+C -> BC (5.1/12.2/19.2) and C+A -> CA (5.0/10.7/16.3), then combine them again with C, A, and B, respectively. The second combination for ABC yielded 7.6/16.2/24.8 with all three approaches. That makes me feel confident that the order is independent. My “sniff test” makes sense too. Combining the distributions causess you to incorporate the first relationship (between A and B, in AB), but does not address the other correlations (between C and either A or B). That correlation is accounted for in the second combination of distributions.